Enlargements take time to down load. Files are 30-50K. Bruce Means was associate producer and appeared in KING RATTLER, an hour-long National Geographic Explorer film about the natural history of the world's largest rattlesnake, North America's most spectacular predator, and America's most dangerous snake. David Wright was the producer/ cinematographer for King Rattler. The documentary reveals that the eastern diamondback is as American as the bald eagle, yet it is poorly known and misunderstood. 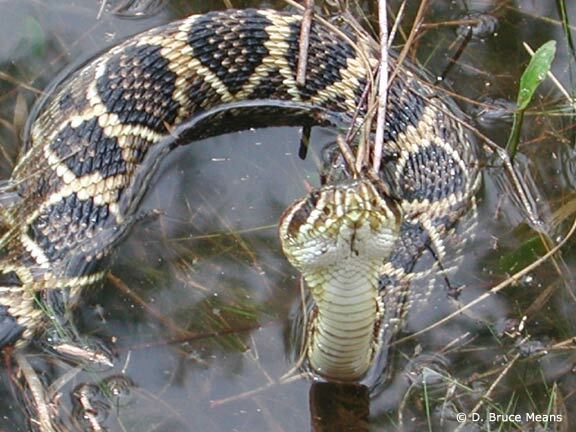 The eastern diamondback is a docile snake, loathe to strike or bite unless provoked. 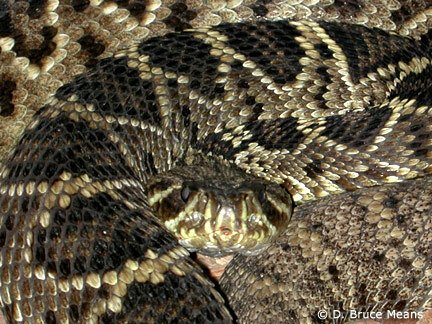 The documentary tells the results of Bruce Means's 35 years' research on the natural history of the eastern diamondback, including a life-threatening envenomation he received while on a remote barrier island by himself. 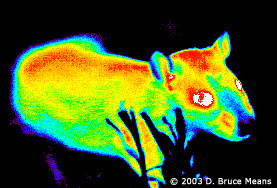 Most of the footage was filmed within 30 miles of Tallahassee, Florida, on property owned by Coastal Plains Institute. as a scientific consultant only. Running time: one hour. THE RAINBOW SERPENT, an hour-long documentary film for National Geographic Explorer. David Wright is the producer/ cinematographer for Rainbow Serpent. The film is about the snakes and natural history of Australia, seeking the origin of the Aboriginal creation myth, a monster snake called the rainbow serpent. RAINBOW SERPENT first aired in August 2002 and appears on MSNBC and National Geographic Channel periodically. DIAMONDBACK SURVIVORS. First aired 29 January 2003. An episode in National Geographic Channel's "Snake Wranglers" series about how the eastern diamondback rattlesnake survives in the face of human onslaught, and the life of D. B. Means who studied the snake for 35 years. Bruce and his son, Ryan, have an adventure looking for rattlesnakes on a Georgia coastal island. BAD RAP VIPERS. First aired 12 February, 2003. An episode for National Geographic Channel's "Snake Wranglers" series about how venomous snakes get a bad rap, featuring defensive behavior in the eastern diamondback rattlesnake. Running time: 30 minutes. SAVING THE KING OF SNAKES. 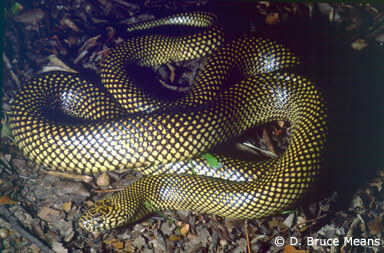 Premiered January 2004 on National Geographic Channel as part of the series, Snake Wranglers II. A documentary film about Bruce Means's discovery of a distinct and new race of the common kingsnake, Lampropeltis getula, in the Florida Panhandle. Means spent 30 years breeding and working out the genetics of this unique population whose common name is Apalachicola Kingsnake. Running time: 30 minutes. SMART REPTILES. 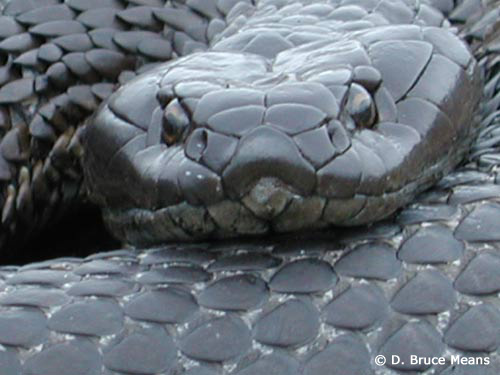 Episode 2 of three hour-long documentary films in the series "Dragons Alive," aired in 2004 about the interesting biology of the world's snakes. D. B. Means was the snake wrangler for the cottonmouth and eastern diamondback rattlesnake and played one of the hunters. BBC Television. INTO THE LOST WORLD.Premiered February 2004 on National Geographic Ultimate Explorer on MSNBC. A documentary film about a 30-day walking and climbing expedition to the northern "Prow" of Mt. 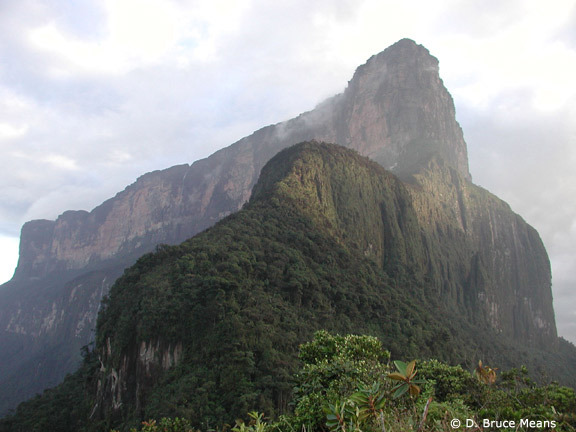 Roraima, and a visit to the summit of Mt. Weiassipu in remote, trackless, southwestern Guyana. D. B. Means appears on camera with Mireya Mayor and Jesus Rivas collecting frogs and plants, finding two species of frogs new to science and making many interesting natural history observations in this hidden corner of the world.